Omega’s first cloud capable digital thermometers HH931T and HH932T offer the easiest data logging functionality available, allowing users to record and store up to 1000 time-stamped measurements accurately. You can store unlimited points when connected via the Bluetooth application. This seamless connectivity allows the user to collect, transmit, and store accurate temperature data for analysis or compliance reporting without any additional or third-party software. 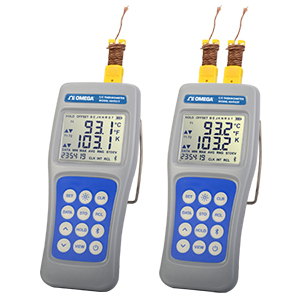 The HH931T single channel and HH932T dual channel meters are compatible with Type K, J, T, E, B, N, R & S thermocouple probes to provide a wide range of temperature measurements from 600 to 1820ºC (1112 to 3308ºF), and they boast a 1000-hour battery life (batteries included). Both meters provide dependable and uninterrupted portable measurement capability without expensive batteries, AC adapters, or chargers. The HH931T and HH932T are well suited for a wide variety of industries such as pharmaceutical, food, automotive, aluminum, environmental, chemical, and HVAC. The creative ergonomic design makes these instruments easy-to-hold, read, and clean. Designed for one-handed operation, these tools are comfortable to carry and use for extended periods of time. Omega backs these durable instruments with a standard 3-year warranty and a 2-year calibration guarantee to ensure that your instrument is ready to use when you need it.